by Jonathon Shafi, Radical Independence Campaign Beneath the headlines, unknown to formal politics and certainly to Better Together, a quiet revolution is taking place. For decades people have put up with the failed politics of Westminster. They have borne the brunt of the UK’s unbalanced economy, and the worst of the massive austerity and privatisation agenda of the Tories. This can only hold for so long. The referendum has opened a door through which people can register their dissent, and their opposition to the Westminster parties. Class is central to the debate and the outcome, because Britain has been run by a millionaire clique in the interests of a tiny minority at the very top. It is in this context that the Radical Independence Campaign have revealed a massive canvass sample of over 18,000 people in communities all over Scotland. Focused on areas of low turnout and socio-economic deprivation brought about by the neoliberal consensus, the results show that working people are ditching Labour spin and voting Yes in their droves. 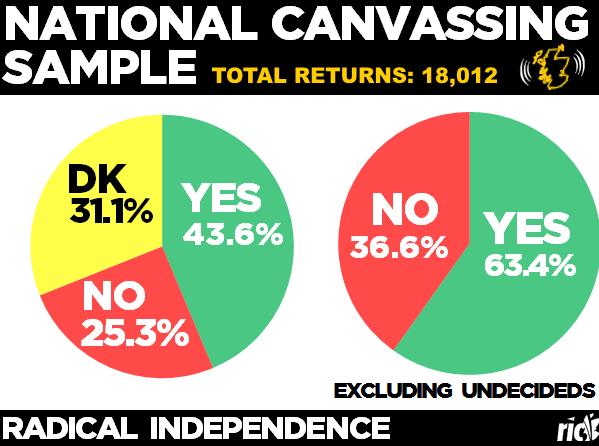 Of the 18,000 returns, when undecideds are removed, Yes is at 63.4 per cent and No at 36.6 per cent. The geographical diversity and the sheer scale of the sample, show that finding overwhelming support for independence in communities left behind by Westminster is not an anomaly. Rather, it is a generalised response to being taken for granted for decades. There is a peaceful, democratic uprising of opposition to the Westminster elite, that realises the potential for change through a Yes vote taking place. What’s important about these findings is that Labour are clearly failing to connect with people. They have relied on a corporate argument which just isn’t being bought. Teaming up with Cameron, Osborne and the Lib Dem sell-outs has not helped either. Traditional Labour support is increasingly moving to Yes. And most moved many months ago. With just weeks to go until polling day one thing is guaranteed: the British State will not have salvaged itself ideologically, or in terms of legitimacy amongst working people. They already know it acts in the interests of the super-rich, and now have the chance to break from the stale Westminster consensus. Labour either doesn’t understand this, or is refusing to look at what is staring them in the face. In doing so, they risk not only losing the referendum, but great swathes of their ‘heartland’ for ever more, as people look for alternatives to privatisation, war and permanent austerity.